As I’m sure you know, I’m still on the look out for a good facial scrub. Two days ago I was in Pak’s and was persuaded by the Sales Assistant to purchase the ‘Hollywood Style Deep Cleansing Apricot Scrub’. Water, juglans regia (walnut) shell powder, mineral oil, stearic acid, glyceryl stearate SE, ceytl alcohol, aloe barbadensis (aloe vera) leaf juice, carthamus tinctorius (safflower) seed oil, tocopheryl acetate (vitamin E), retinyl palmitate (vitamin A), petrolatum, butyrospermum parkii (shea butter) oil, polysorbate 60, triethanolamine, magnesium aluminium silicate, titanium dioxide, prunus armeniaca (apricot) fruit extract, prunus armeniaca (apricot) kernel oil, glycolic acid, glycine soja (soybean) seed extract, polyquatemium 7, rubus idaeus (raspberry) fruit extract, tilia cordata (little-leaf inden) flower extract, fragrance, methylparaben, propylparaben, and DMDM hydantoin. Apply a small amount of scrub to wet face and gently massage in a circular motion for a few minutes. Avoid eye area. Rinse well. It is recommended that you follow up with the Hollywood Style Toner and finish off with one of our moisturizers to calm, smooth and balance skin*. 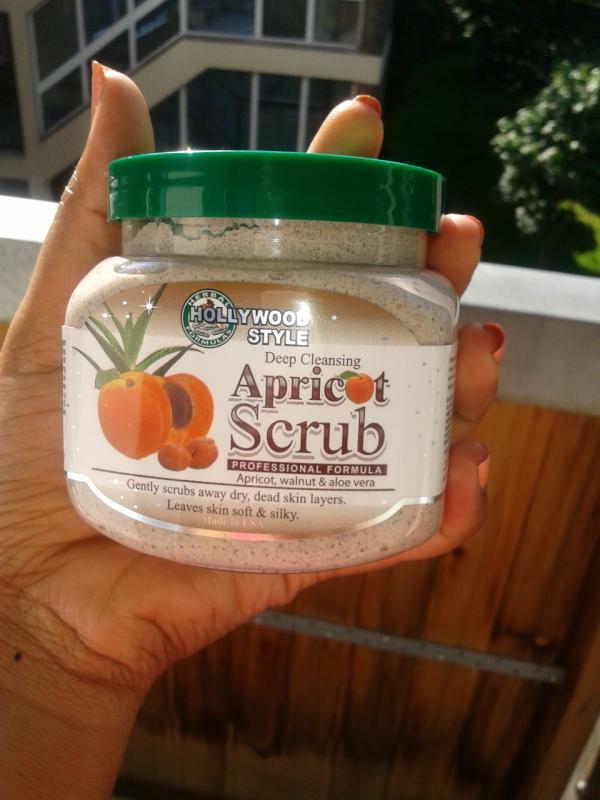 Our improved 2-in-1 apricot scrub is creamier and has extra, bigger scrubbers of dried walnut kernels. The formulation also contains natural vitamins, herbs and exfoliants in a rich creamy base. It will deep clean your pores of oil, dirt, debris, while gently removing dead skin layers that make complexion look dull, dry and flaky, Your skin will feel invigorated, revitalized and clean like never before; pores will look smaller, facial texture and will be smoother, softer, and have a healthy glow. Aloe vera, shea butter, apricot oil, and vitamins A and E provide moisture and healing protection. Recommended for all skin types. Application Method: I put the mask on my fingertips and massaged the scrub unto my face in circular motions. FYI, my face was dry prior to application. Whilst massaging my face in circular motions, I noticed my face was stinging. After application, I usually like to leave my scrubs on for a few minutes before rinsing. However, the stinging had intensified, and was beginning to feel unbearable, and I knew I needed to wash this off my face immediately. When I removed this off my face, I had red blotches across my forehead, cheeks and nose. I was really shocked, in all my nineteen years of existence, I have never seen my face so red before. After mositurizing, and about twenty minutes later the redness vanished. Final thoughts: I would definitely not recommend this product for people with dry/sensitive/ eczema-prone skin like myself, as I feel that the exfoliating beads on this product are far too harsh on the skin. Price-£2.99 (5/5) The price is great, and considering you pay the same price for the same mask in a smaller tube, you’d be silly not to opt for this one as it’s in a jar, so it’s deffo more value for your money. Smell (1/5) This product smells like apricots. I find the smell sickeningly sweet. Upon first encounter with my nostrils, I liked the smell, but after a while I began to feel the smell of apricots was too overpowering, and was rather sickening. Texture/Feel (1/5) When you put this product on your fingertips it feels super smooth. When I first touched it, I loved how soft and nice it felt on my finger tips, however when you put it on your face it’s an entirely different story. When on your face it feels like you’re in hell (literally). Overall rating (1/5) The only good thing I can say about this product is that it did leave my skin feeling soft. However, I’m sure there is a product out there that will leave my skin feeling just as soft (if not softer) and will not have any undesirable side effects. Side Note: This product does say you should apply to a wet face, which I didn’t do, as my face was dry upon application. I decided to retest this product, by wetting a patch of my face, and this made no difference whatsoever. I still had the burning sensation and red blotches. Therefore, I feel I can confidently say that this product is not good for people with dry or sensitive skin. If anyone with oily/combo skin would like to try out this product, then they can do so at their own risk. Would I repurchase? Hell no.